Battle Royale is a film adaptation of Koushun Takami’s 1999 novel of the same name. 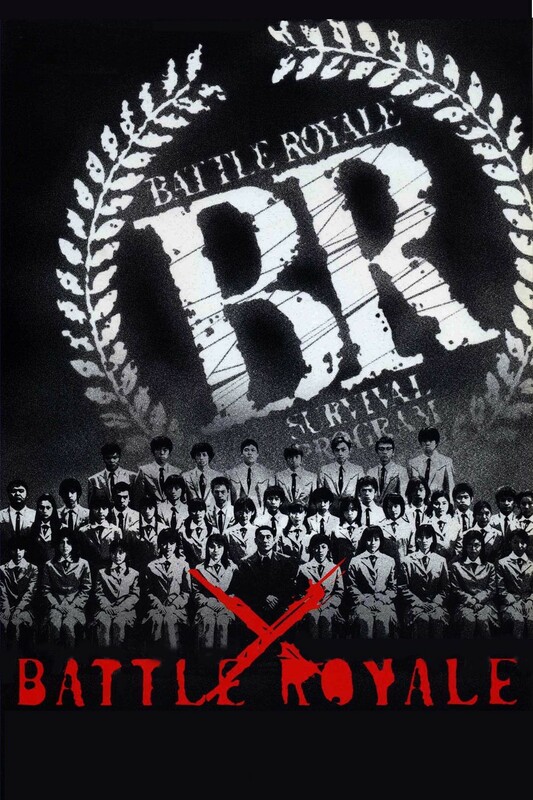 Battle Royale is set in a dystopian Japan, where a program called the BR Act was passed by the Japanese government after 800,000 school children walked out of school. Under the BR Act, a school class is chosen at random to participate in a three-day event on a remote island, in which the aim is to kill your classmates and be the last person standing. If there is not a clear winner after the three days are up, the electric collars that are fitted around the student’s necks before the event will explode, killing all remaining survivors. In the film, class 3-B fromShiroiwa Junior High School is chosen to participate in the annual Battle Royale. Their former class teacher, Kitano (who resigned from his position at the school the year prior after he was stabbed in the leg by Yoshitoki, one of his students) is the head instructor of the program. Each student is provided with a bag containing food, water, a map of the island, a compass, and a random weapon, which could range useful weapons like a gun, or useless weapon like a paper fan. Once the first student enters the remote island, the battle begins. Battle Royale is a difficult film to watch, there was never a time that I felt comfortable with what I was watching. This was mainly down to how quickly the students turned to killing each other before they had even tried to come up with a plan that could spare all of their lives. For the most part, I was thoroughly impressed with Battle Royale. The performances in the film are mostly excellent and despite the young age the cast, the film is full of compelling and complex characters, who are struggling to come to terms with this moral dilemma that they have had forced upon them. Despite the intense scenes and gory deaths, there are some genuinely moving moments in Battle Royale, allowing for this film to not just be a senseless gore fest, but in fact, the film is a rather damning examination of the human condition, and how little it would take to destroy our moral compasses. In this regard, Battle Royale is an emotionally powerful film and holds more weight than your average action-packed gore fest. There are some issues with this film, however. The dialogue in the film is a little cheesy, which can, at times, make intense scenes lose some of their weight and almost make this the film feel like a B-movie at times. Additionally, there are a lot of scenes in which characters confess their love or attraction towards another character. In some instances, the admission of affection from one character to another is moving and adds some real weight and intensity to a scene. Sadly, this device is over-used and it starts to become a rather predictable event in the film. Overall, Battle Royale is an excellent film, with many memorable scenes and a story that will haunt you long after you have finished watching the film. It is a real masterpiece of Japanese cinema.